The Ice Bucket Challenge was a hit a few months back. I first saw a video of my niece, Franchesca -who lives in Philadelphia, doing the challenge. It was actually fun seeing people, celebrities as well as ordinary citizens, pour a bucket of ice on themselves but some did it just for the fun of it without even knowing the objective of Ice Bucket Challenge. I read about ALS but only realized the gravity of the disease after watching You're Not You movie at SM Megamall Cinema last night. You're Not You is based on the novel by Michelle Wildgen. 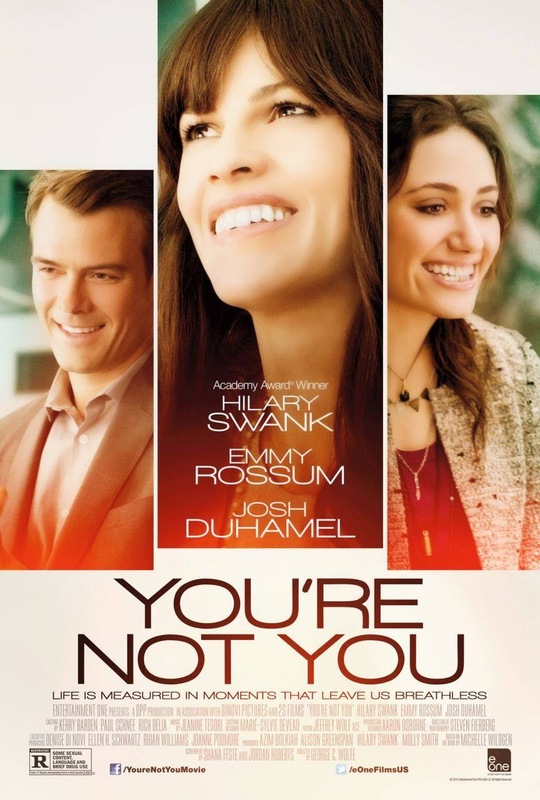 It is directed by George C. Wolfe, and starring Hilary Swank, Emmy Rossum and Josh Duhamel. With a running time of 103 minutes, be sure to bring facial tissue for this is a tear-jerking. Proof? Well, the cinema is quiet and I didn't see anyone texting (which is really impossible). Probably, most, if not all, were trying not make a sound while crying. This movie gives face to the much talked about ALS and will definitely make people more compassionate with victim of the said disease. As for the actors, Hilary Swank delivers another award-worthy turn in this physically and emotionally complex drama. Emmy Rossum played her character well as the directionless young woman who finds spiritual redemption while working as Swank's assistant. Josh Duhamel, oh my Josh! I'm actually not a fan but in this movie, I find him cutely handsome, although I do not like the character he played as a cheating husband. Kate is a suave, successful classical pianist just diagnosed with ALS (commonly known as Lou Gehrigs Disease). Bec is a brash college student and would-be rock singer who can barely keep her wildly chaotic affairs, romantic and otherwise, together. Yet, when Bectakes a job assisting Kate, Kate sees something special in the way Bec takes care of her. Kateand Bec find each other’s strength through their weaknesses. You&#039;re Not You explores howtwo strangers can bring out the best in each other even in the midst of trials andtribulations. WHAT IS ALS?Amyotrophic lateral sclerosis (ALS) or Lou Gehrig's disease, and rarely Charcot disease—isa neurodegenerative disorder with various causes. The term motor neurone disease (MND) is sometimes used interchangeably with ALS while others use it to refer to a group of similar conditions that include ALS. ALS is characterised by muscle spasticity, rapidly progressive weakness due to muscle wasting. This results in difficulty speaking, swallowing, and breathing. The disease usually starts around the age of 60, except in cases that are directly inherited when the usual age of onset is around 50.